Happy 5th Anniversary to my honeydew mango blossom, Sajan. This was us three years ago. And we’re still happy as ever! On our one-year anniversary we made a little road trip to San Antonio. Year two, we ate at Perry’s Steakhouse. Year three, somehow I was with my brother and Sajan had dinner with our friend Liz. Last year, we were snuggling with our 7-month-old baby, and this year we’ll be at my dear friend Sonal’s wedding. having back yard parties. we love grilling it up! and putting up little hammocks. and making s’mores over a cracklin’ fire. I remember when we were 6 months married I thought it was a milestone. Five years makes us marriage veterans! This is us almost one year before tying the knot. 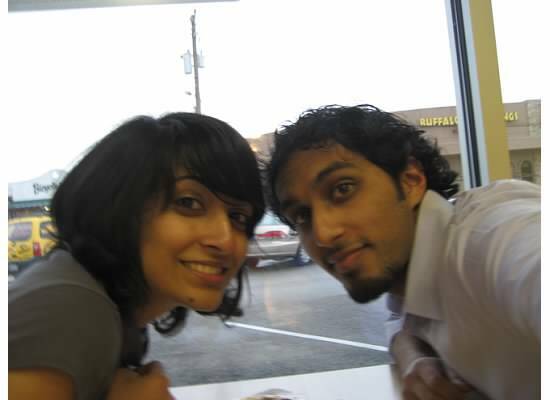 At TCBY in Rice Village when I was 23 and Sajan was 25. This entry was posted in The Marriage Chronicles and tagged anniversary, marriage, memories. Bookmark the permalink. you guys are two of my favorites. here to another happy 5 years. ps hi layla!